5 Minutes for Mom is hosting a CLR Tackle it Tuesday today and so I have decided to join my first ever Tackle it Tuesday! This may not seem like a big deal to you all. But trust me. It is. You should all be very proud of me for the amount of tackling I did today. Really. 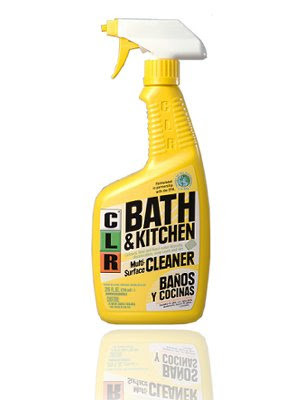 I was sent a bottle of CLR Bath & Kitchen cleaner in honour of this auspicious occasion! And I must say it worked like a charm! I was very impressed. The first room I tackled was my bathroom. It was a mess. We have hard water and it creates this horrible stain in the tub and it drives me crazy! CLR did the job amazingly well! I must admit that I was a wee bit sceptical that CLR could help since I have tried a multitude of products all to no avail. But I was pleasantly surprised! It also made my sink and toilet nice and shiny and sparkling clean! The pictures just don't do it justice so you'll just have to trust me... it was a HUGE improvement! Next I tackled my disaster of a kitchen. I know it LOOKS like I've never cleaned the kitchen before but honest, I cleaned it yesterday! I don't know how it gets so bad so quick... it must be gremlins. I used CLR to clean my counters, stove, the front of my dishwasher and my sinks. It did a fantastic job, especially with my sinks. I didn't even realize how gross they were until I was done cleaning them and the sparkled so pretty! And here is my lovely clean sparkly kitchen! I even wiped down my cupboards and washed my floor on my hands and knees people! Now if only I could keep it that way for longer than three and half seconds! When the bottle tells you to wear gloves while using their product... USE GLOVES! Don't be like me... I never use gloves and now my hands feel like dry sandpaper. Lovely. So are you proud of me? Very proud! It looks awesome! I am so proud of you!! You have really got me motivated. Everything is sparkling!! I have wondered if CLR worked but I did want to waste money trying it. I am going to go get some tomorrow. I could really use it in the kid's bathroom. Thank for the glove tip too. I never use gloves when it says too. I AM proud of you! And CLR does do a number to your skin. Your kitchen looks so nice and bright...keep those boys outta there! Wow, amazing what incentive can do isn't it. I didn't get the whole kitchen clean but the sink is a thing of beauty. wow looks great thanks for the tip about the gloves, I never wear them either.